Since its foundation, the International Center of the Roerichs carries out cultural and educational activities aiming at attracting public attention to the problems of preserving cultural heritage and world peace, to popularize among the Russian and international public the fundamental peacekeeping idea of the Roerich Pact – Peace through Culture. in the Peace Palace in The Hague during the UN Conference “The Hague Appeal for peace”, Netherlands; in the Russian Centre of science and culture in New Delhi, at Naggar, Mumbai, Kolkata, Trivandrum, India; in the State Duma, Russia; at the UN headquarters in New York, in the Russian cultural center at the Embassy of Russia in Washington, United States; in Bruges, Belgium; in Mexico in the towns of Bernal, Morelia, Toluca and Saltillo; in Buenos Aires, Argentina; at the State agency “Archives”, at the National Gallery of foreign art and the National Museum “Land and people” in Sofia, Bulgaria; during the International Conference “Archaeology in the context of the armed conflict,” in the UN Office at Vienna, at the headquarters of the Ministry of defence of Austria; Russian Centre of science and culture in Berlin, Germany; in Shanghai, China; at the International Institute of Human Rights in San Remo, Italy. In the year 2012, at the UNESCO headquarters in Paris, a new large international cultural-educational exhibition project of the International Center of the Roerichs was launched: “The Roerich Pact. History and Modernity“, dedicated to the preservation of the cultural heritage of mankind and world peace on our planet based on the ideas of the Roerich Pact. It became the largest public initiative in this field and was dedicated to the 80th anniversary of the Pact in the year 2015. From 2012 onwards, in the framework of the project “The Roerich Pact. History and Modernity” the exhibitions have been held in 17 countries in Europe, America and Asia (France, Argentina, Switzerland, Uruguay, Germany, Russia, Chile, Kazakhstan, Netherlands, Kyrgyzstan, India, Belarus, Spain, Bulgaria, United States, Austria, Finland), including: at UNESCO headquarters in Paris (2012), the UN Office at Geneva (2013), in the Peace Palace at the Hague (2014) at UN headquarters in New York (2015), at the United Nations Office in Vienna (2015). Since 2014, Russia’s inhabitants saw the exhibition in more than 110 cities. The project became Russia’s largest public initiative in the preservation of culture and peace over the years. The project of the International Center of the Roerichs brought together in collaboration public organizations of many countries and regions of the world. Support for the project provided by the heads of State and parliaments, mayors, public authorities, including the Ministry of Foreign Affairs of the Russian Federation, Rossotrudnichestvo, the administration of the President of Argentina and the Argentine Ministry of Education, Ministry of Education of Uruguay, National UNESCO Commission in Bulgaria, the German UNESCO Commission. In the year 2013, in the Cathedral of Buenos Aires, Argentina, the ceremony of consecration of the Banner of Peace, provided by the International Center of the Roerichs took place. In total, the exhibitions and events of the project visited more than 500 thousand people. Media and Internet made more than 30 million people in different countries familiar with information about the project. The peacekeeping activities of the International Center of the Roerichs passes in fruitful cooperation with UNESCO. Under the patronage of UNESCO in Moscow, at the public Museum by name of N.K. Roerich in September 2014 year, the exhibition “Peace through Culture” took place. The exhibition presented materials telling about the development of the idea of preserving the world from the first peace conferences at the Hague in 1899 and 1907 and onwards to the present day. In the days of the exhibition Roundtable on the topic “Nicholas Roerich’s appeal “Peace through Culture” – Path to the elimination of wars and the establishment of a lasting peace”. On May 10, 2105, the Director-General of UNESCO, Ms Irina Bokova personally visited the public Museum by name of N.K. Roerich of the International Center of the Roerichs as a gesture of honour to his work on the preservation of culture and peace. UNESCO Director-General Irina Bokova: “UNESCO is pleased about cooperations between institutions that are engaged in the preservation of cultural heritage, such as the International Center of the Roerichs. I would like to express my gratitude to the Center for organizing this brilliant educational exhibition”. UN Secretary General Ban Ki-moon: “This exhibition pays tribute to the innovative idea of the Roerich Pact and shows our determination to push this idea forward. I want to thank the International Center of the Roerichs for organizing this inspiring exhibition. I appeal to the Governments and peoples throughout the world to work together for the protection of our common heritage and all mankind”. 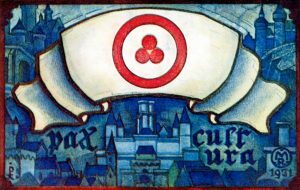 The Roerich Pact and the Banner of Peace have a deep moral and spiritual essence, which is inseparably linked with the creation of Peace and Beauty. The long-term peacekeeping activities of the ICR contributes to these basics in the life of mankind. The International exhibition project “The Roerich Pact. 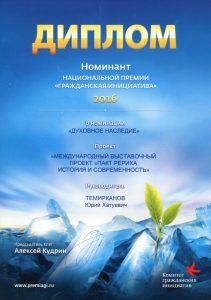 History and Modernity” by the International Center of the Roerichs became the nominee of the Russian Award “Civil Initiative” for the year 2016 and entered the short-list in the nomination “Spiritual Heritage”.